Start designing the engagement ring of your dreams. You can choose the setting first or the diamond first. Customize the type of metal, the design, add a diamond or colored gemstone. From oval, round, cushion, princess, and emerald from 1 carat to 10 carats, we walk you through the entire process until you have the perfect ring. We make custom jewelry process a snap. You can have a custom piece made in as little as 2 weeks. It's never been easier to create the ring of her dreams, so why not create something one of a kind. Whether it's choosing a unique gemstone, drawing inspiration from a beautiful setting, or looking to put together pieces you love from many different rings, at Inter-Continental Jewelers we love helping you design the most important rings she will ever wear. 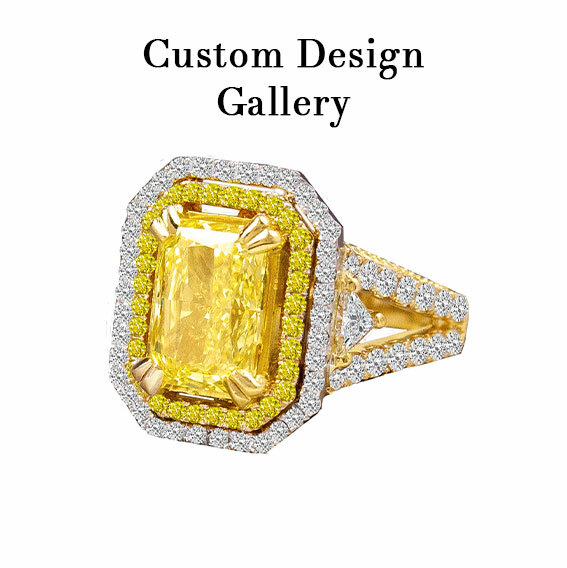 At Houston Custom Jewelers, we have years of custom design experience behind our name and do an extensive amount of custom pieces right here in our Houston showroom. Customizing a ring at Inter-Continental Jewelers means never worrying to yourself, “I think I know what I want, but I'm afraid I won't like the design when it's finished.” We feel confident that you will love the design when it is finished! Why are we so sure you will love the final product? We know certain items like fine jewelry have to be tested out and tried on to ensure that the original vision translates seamlessly into a 3D object, or else some design ideas can go from daring to dud. For this reason, we create a mold from our 3D CAD design and let you try on the wax figure before we move forward in diamonds, gold, platinum, or gemstone setting. Instead of falling flat, your original vision will leap off the page and make an amazing transition that you will not believe! We place all the creative control that you desire in your hands so that your unique design is exactly what you want us to craft for you! It’s never been easier to create the ring that you and your darling will love forever. Start with selecting a GIA certified center diamond or the setting. Then customize the type of precious metal, the design, add a diamond or colored gemstone, and more. The possible combinations are endless! 3. We Are So Happy To Guide You Throughout the Process! Maybe the endless possibilities have your head spinning so that you can’t tell a channel-set oval diamond engagement ring in rose gold from a pave princess-cut diamond engagement ring in platinum. Perhaps you would love to design a custom ring but don’t know where to start or how to draw what is in your mind. That is why we are here to help you, so let your worries vanish! Many of our customers bring us pictures of rings they love, often pulling inspiration from many places. Most people don't have the exact piece drawn out when they come to our showroom, but rather pictures of rings they love but can’t necessarily locate. Let us walk you through the entire process until you have the perfect ring as we show you oval, round, cushion, princess, emerald, and more from 1 carat to 10 carats! Whether you are choosing a unique gemstone, drawing inspiration from a beautiful setting, or hoping to use elements from several different rings you love, we will make the custom design process easy and stress-free for you. What if you rush through our front door and cry out, “I waited too long, and I want to propose soon!” We’ll say, “That’s fantastic!” You can have your Custom Ring made in as little as two weeks! In many cases, we complete custom orders between 2-4 weeks. If you need it even faster, call us about a rush order. We try to accommodate all of our custom design needs. You’ll be thrilled to know that, contrary to what you may have heard, customization does not mean spending a small fortune or exceeding your budget! 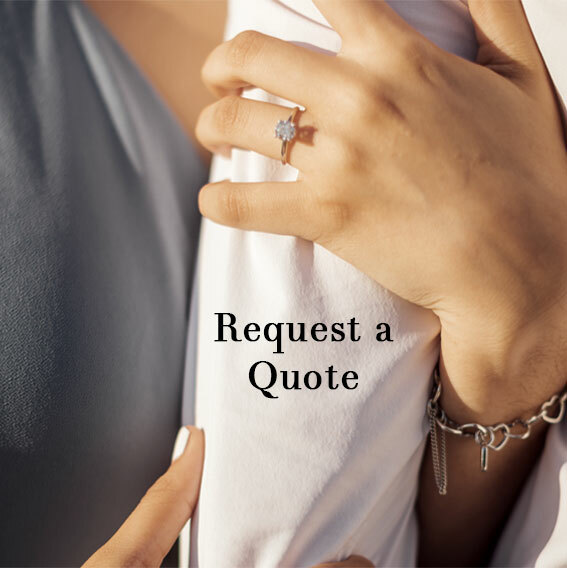 Custom designing a splendid ring lets you decide how you want to spend your jewelry budget so you can devote it to what’s most important to the two of you. For some couples, the diamond size matters more than the diamond color, and for others, using a colored gemstone like a deeply-hued sapphire is the chief desire. Whatever matters most to you and your beloved, you’ll happily find that often the only difference in price between a custom design and selecting a comparable piece out of our cases is a small fee for the wax mold we use in the custom design process. 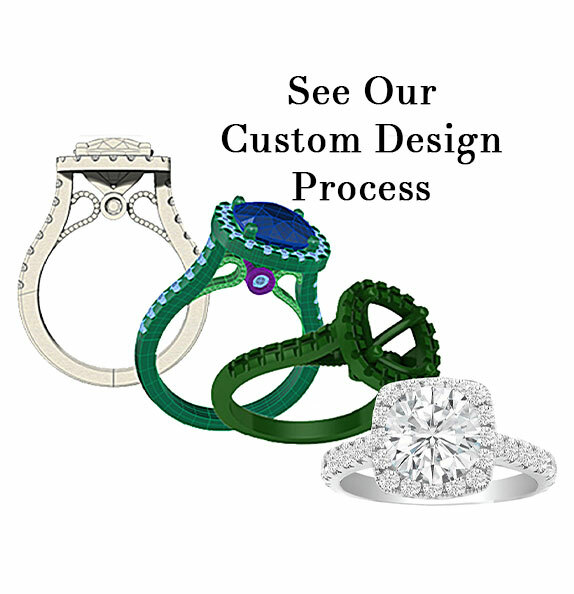 We love helping you design the most meaningful ring she will ever wear, so please call us at 785-9600 to get started in bringing your brilliant design to life.